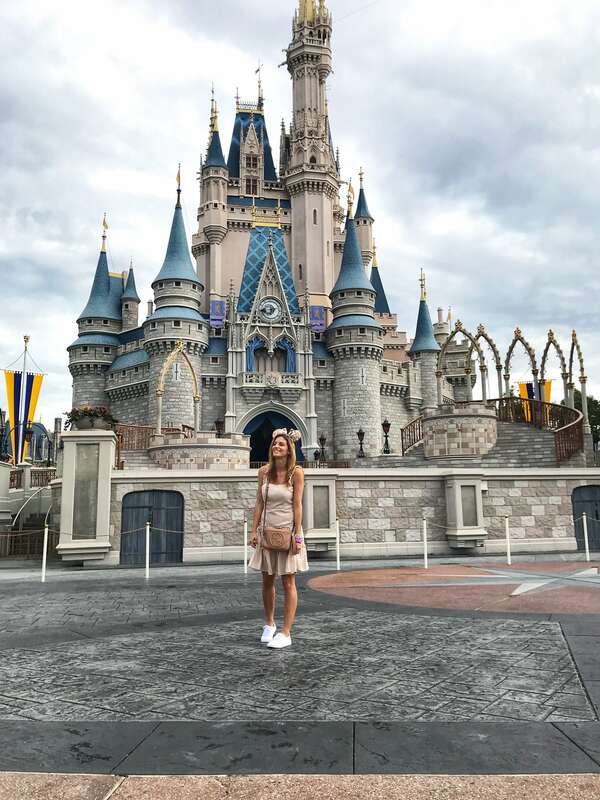 We just spent 10 days at Walt Disney World, and I felt like I could write 5 separate posts about it! A lot of planning went into this trip, and I’d really like to make it easier on those of you who are planning on going in the future. Below I have my tips and tricks to making this a memorable and easy vacation – I’ve bolded some of the key tips below that I think are must-have tips. Lot’s of ponchos! Florida is HOT so it rains often. We packed a set of ponchos for each day that we picked up from the dollar store because at the parks they are just over $10. Our son is six, so we still needed a stroller but didn’t want to lug it on the plane so we rented one in advance from Orlando for Families. We chose the make and model we wanted online, and at checkout we used a code for a free case of water as well! 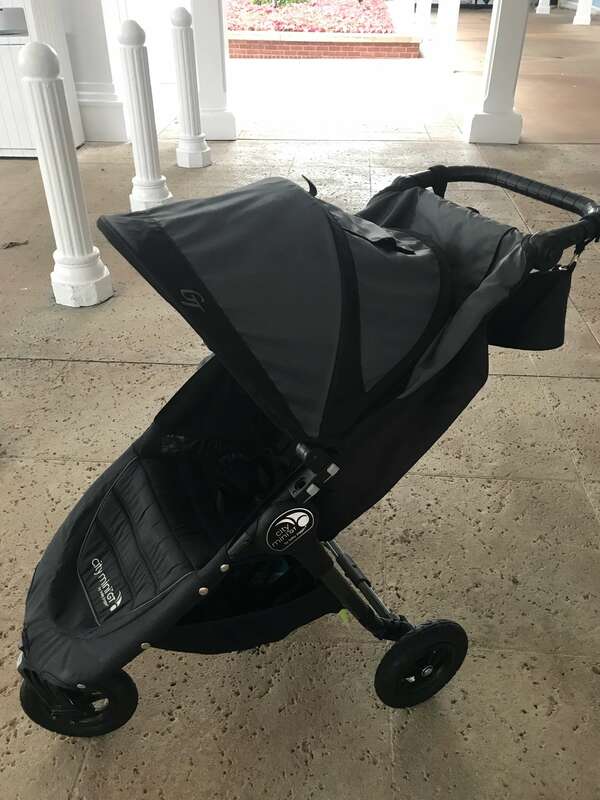 We entered our resort arrival date and flight time, and the moment we arrived at our resort they delivered our stroller. This was essential to our trip – it came with a rain cover, plus I ordered a wireless fan for our son so he could stay cool. The day we left they picked it up as our airport pick up arrived. This service was amazing – I highly recommend them! When you arrive in Orlando, go to Target! I’m not talking about clothes shopping, I’m talking about the essentials. 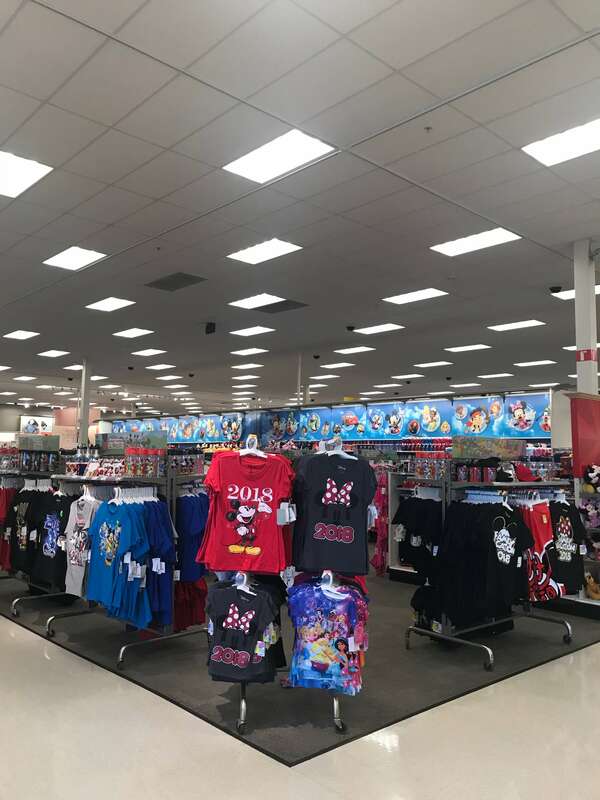 The Disney souvenir section at Target was the biggest I have ever seen anywhere, at a fraction of the price! We picked up snacks, alcohol, and I came down with a cold so over-the-counter medication. Disney stocks a limited supply of medication in some of their shops (it’s often behind the counter so you need to ask (Advil, Halls, ect.) but if you need something more a Target run is necessary. We also signed up for the Memory Maker before we left which meant Disney photographers in the park would take our photo and if we tapped our band they would load straight to the My Disney experience App! Photos from rides would go there as well! Totally worth it for family photos! 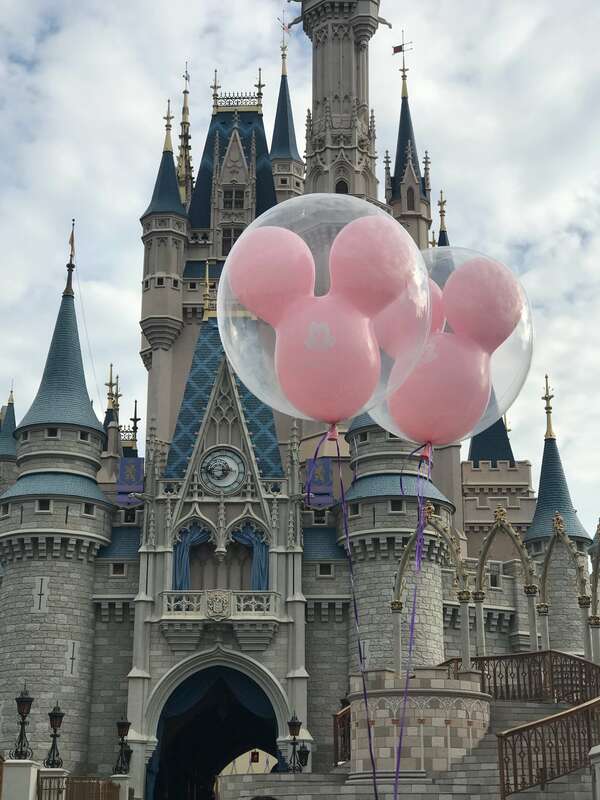 Here are two examples of photos they took – the second has a bit of Disney magic they added to it! Each photographer often had something they could add to the photos! 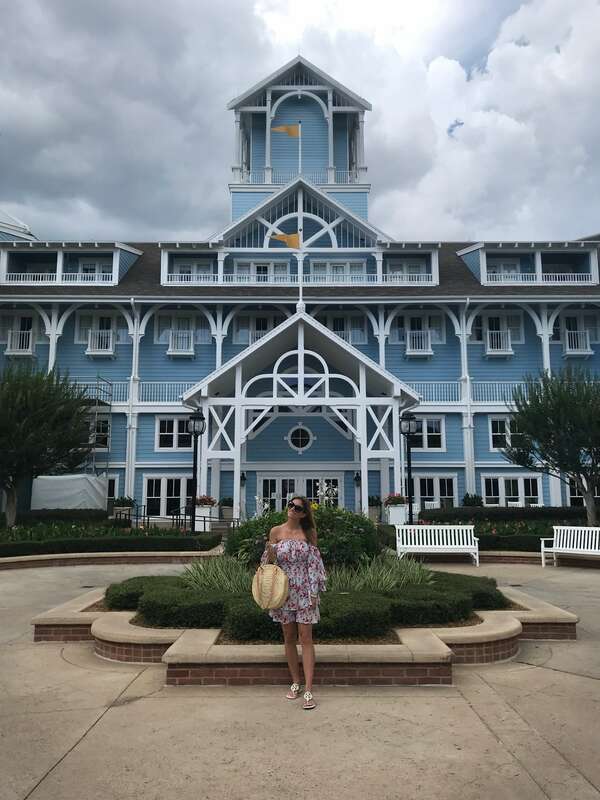 We stayed at a Disney Beach Club Resort. 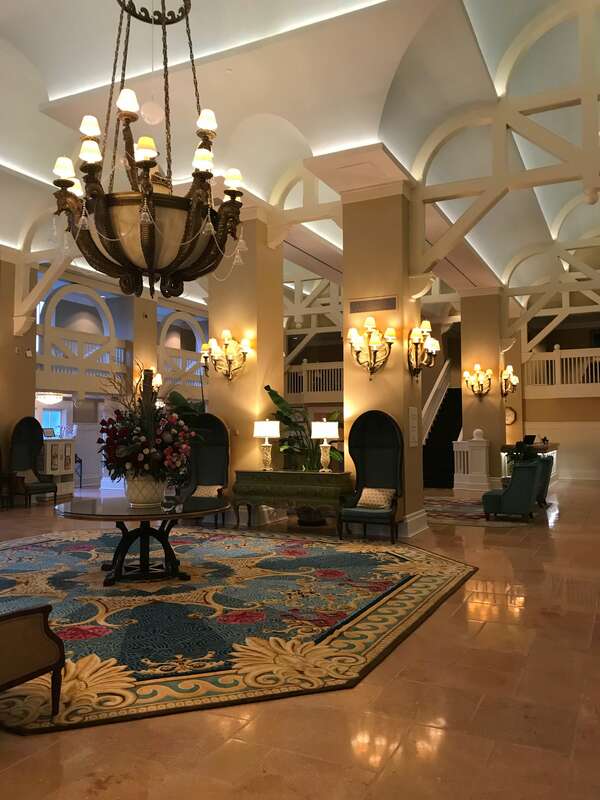 We stayed on-property for a few reasons – short commute to the parks, Extra Magic Hours, and MagicBands. 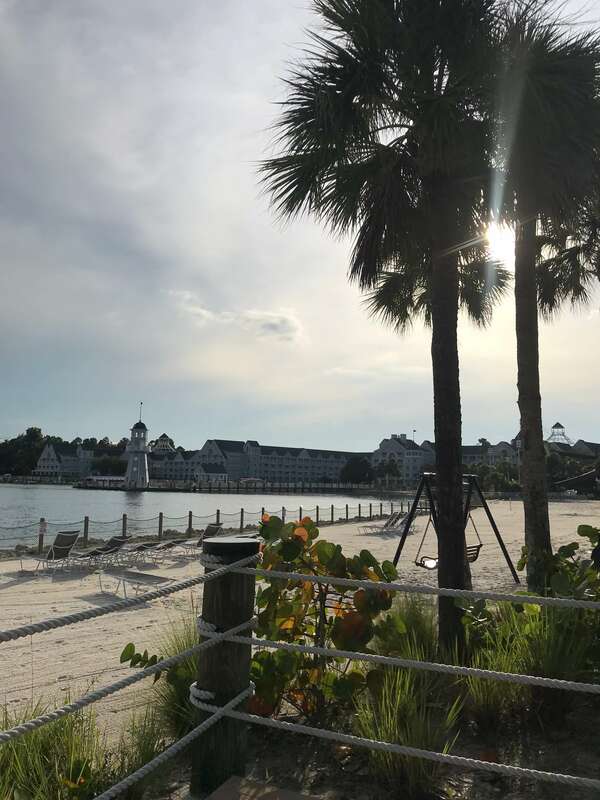 Our resort was a 5 minute walk to both Epcot and Boardwalk Resort. This was huge. 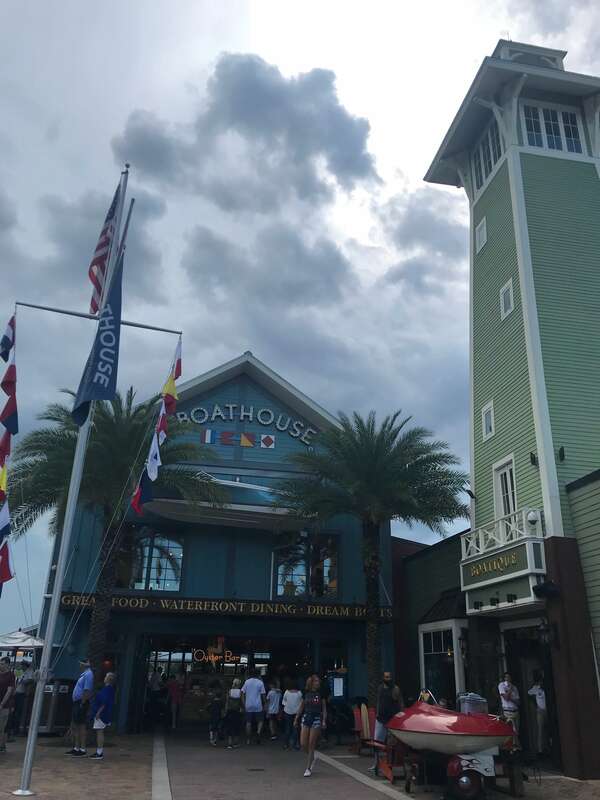 We had plenty of dining options, but for even more variation we could take a boat or short walk to Boardwalk for even more food and entertainment options. 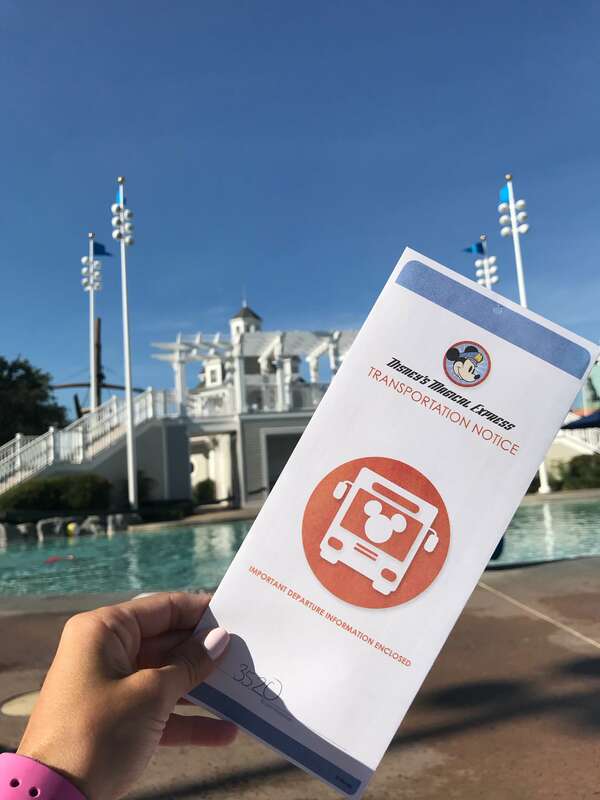 Disney resort guests can also make their dining and FastPass reservations in advance of all other park guests – 60 days in advance for FastPasses, and 180 days out for dining reservations! Epcot had a separate entrance just for Boardwalk and Beach/Yacht Club guests! No lines, and the walk was so short we could grab dinner or catch the fireworks. 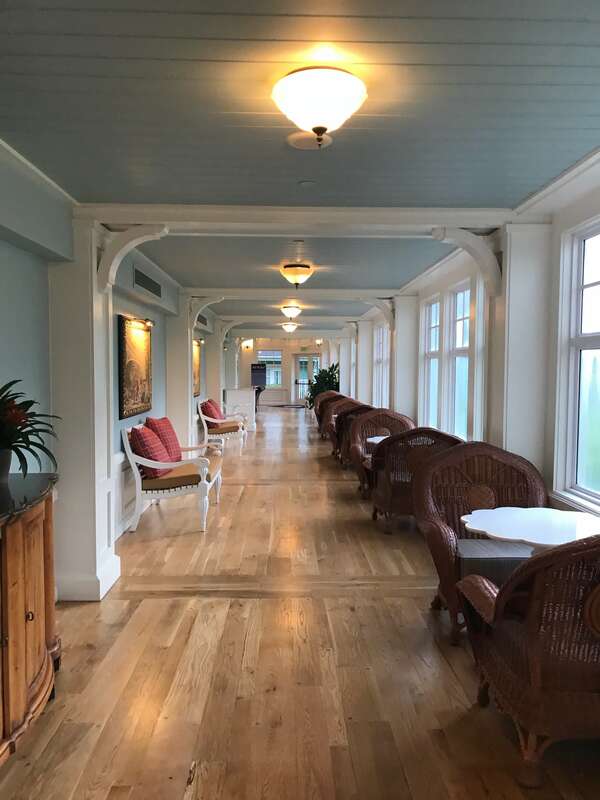 Our resort was attached to Disney’s Yacht Club Resort which was very similar to ours, but the decor matched what you would expect from a yacht club. The Beach Club was much more laid back. 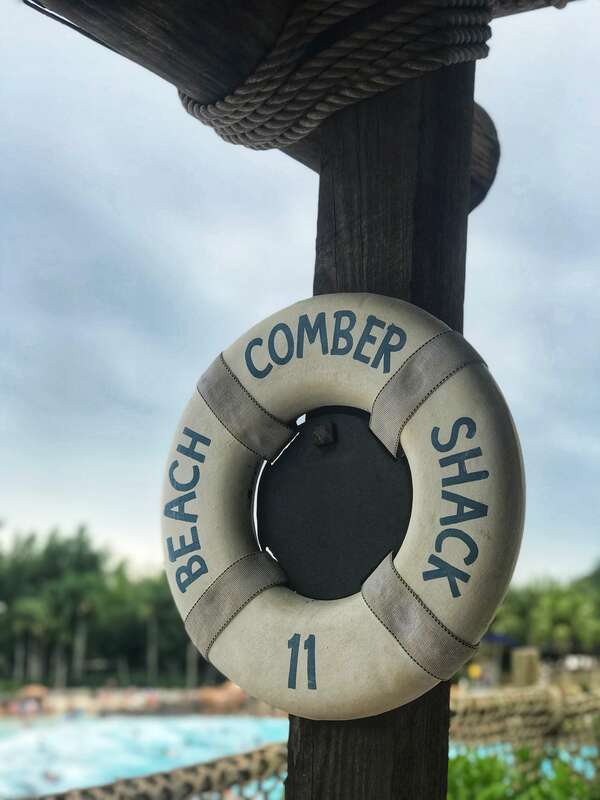 We loved the quick service more at Yacht Club (fresh smoothies and oatmeal in the morning, cheese plates in the afternoon) but the Beach Club had a larger market place with more food options including groceries if you had a room with a kitchen. At the Beach Club we ate at Hurricane Hannah’s which was near the pool and served kids meals in a take home bucket and pail, and burgers, fries and other quick serve meals. Tip – they provide beepers to take with you when your food is ready, but at peak times it can take a while. 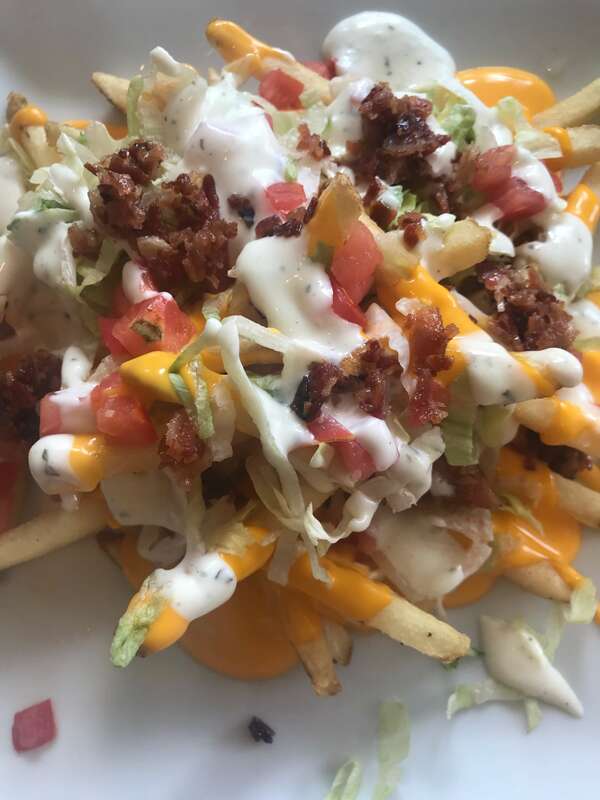 Order early, then head back to the pool with your beeper till you are ready to eat! 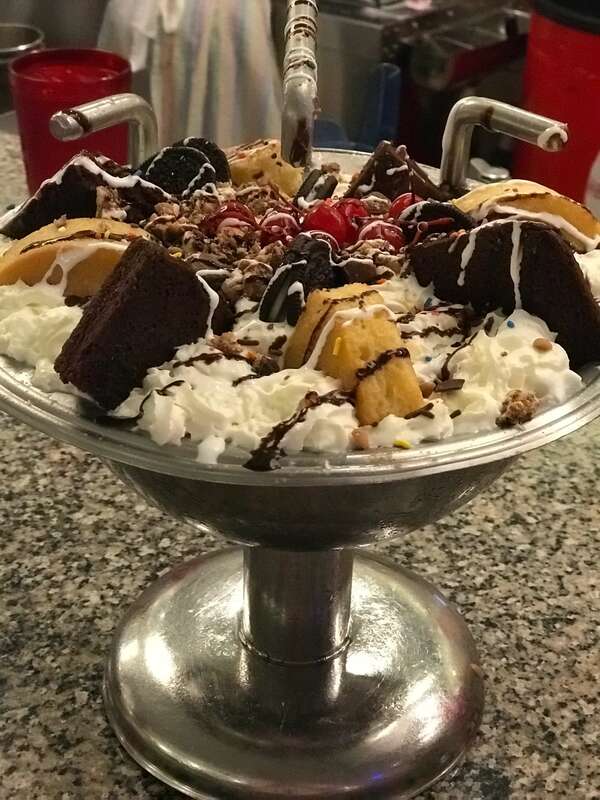 We also ate at Beaches & Cream – famous for it’s ice cream! I had a very hard time getting a reservation here! Tip – walk up and put yourself on the list before dinner. The wait was two hours most nights, so we would go on the list and they would text us when we had a table. 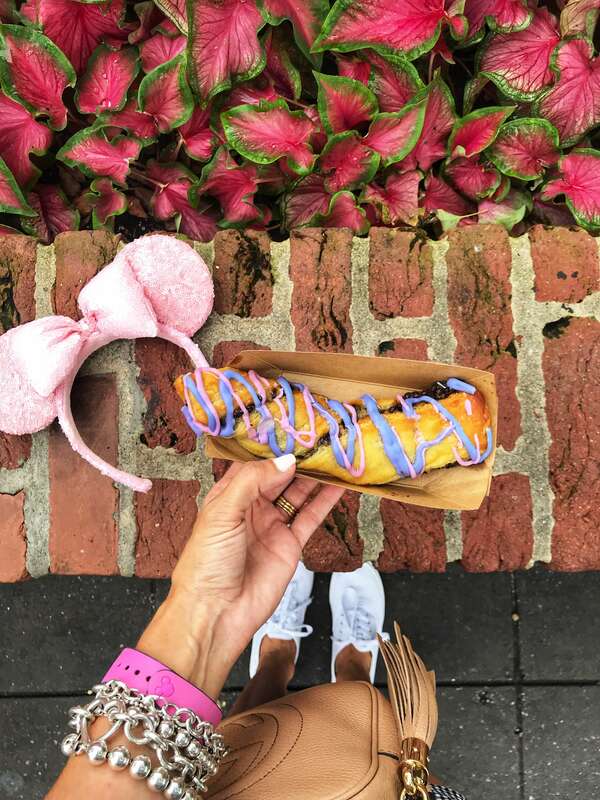 Also, they have a walk up window – you can ask for the full menu but you can’t get the famous Kitchen Sink at the walk-up window – just the mini version. When you order the Kitchen Sink they lower the lights, flash the lights like an alarm going off, and yell that it’s coming on it’s way to you! Definitely to be shared by three or more! Overall I loved the resort! The lobby smelled amazing, and I loved how they said “Welcome Home” overtime we walked through the doors! 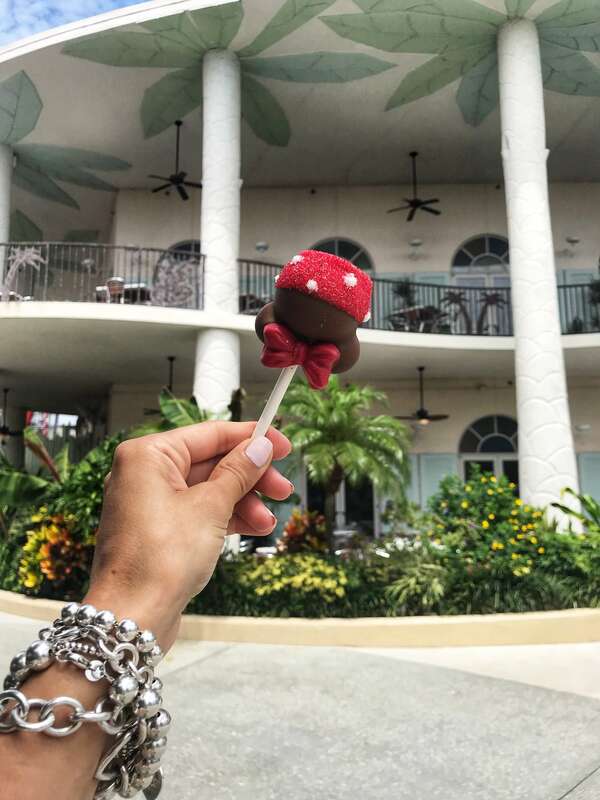 There were plenty of food options with the restaurants at Beach Club, Yacht Club, and with Boardwalk being a short walk away! We loved being able to watch the fireworks at night from Epcot, and being a short walk from that park as well. The waterpark at Beach Club was amazing as well! Lots of pools including one with sand and a sandy bottom, and a very cool pirateship waterslide! There were movies on the lawn at night, and one night we roasted marshmallows outside as well. The Sandcastle Club was at our resort as well – for $55USD you could drop off your child and they would be fed dinner, and would have some fun activities until pick up at 10pm. Our son had a luau with Mickey Mouse, played video games, did a science experiment, baked cookies and did a craft. He LOVED it! We received MagicBands because we stayed at a Disney resort (they are also for annual pass holders) and they were a really fun perk to our trip! We chose the colour of them and had our names written on them, and we picked them up when we arrived to our resort! American residents may have them mailed to them, but we had to pick them up since we are from Canada. They were linked to my credit card – we tapped them to enter our room, enter the theme parks, and pay for anything at the park. For a 10 day trip we purchased a 6 day Hopper Plus Pass. 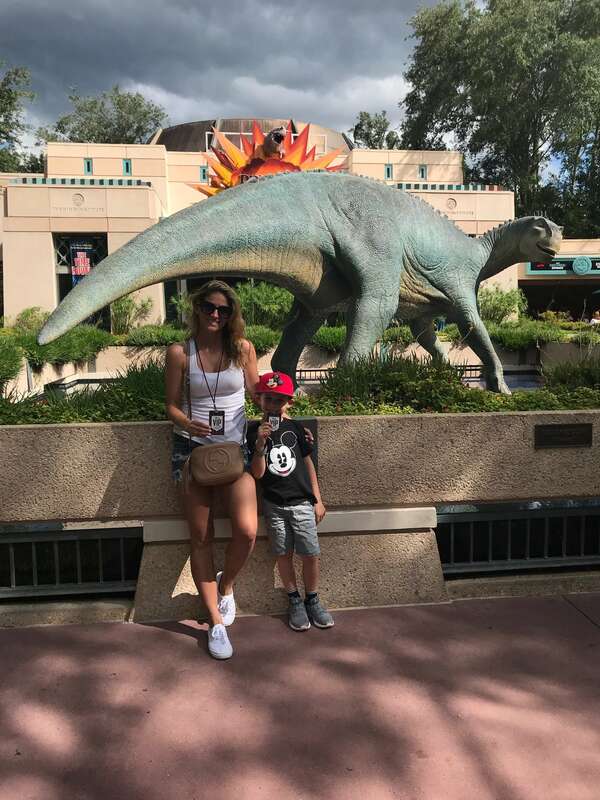 This meant we could got to any park we wanted for 6 days – even multiple on one day! I didn’t think we would use this option but we did. With Epcot so close, we went many times just for a meal or fireworks. 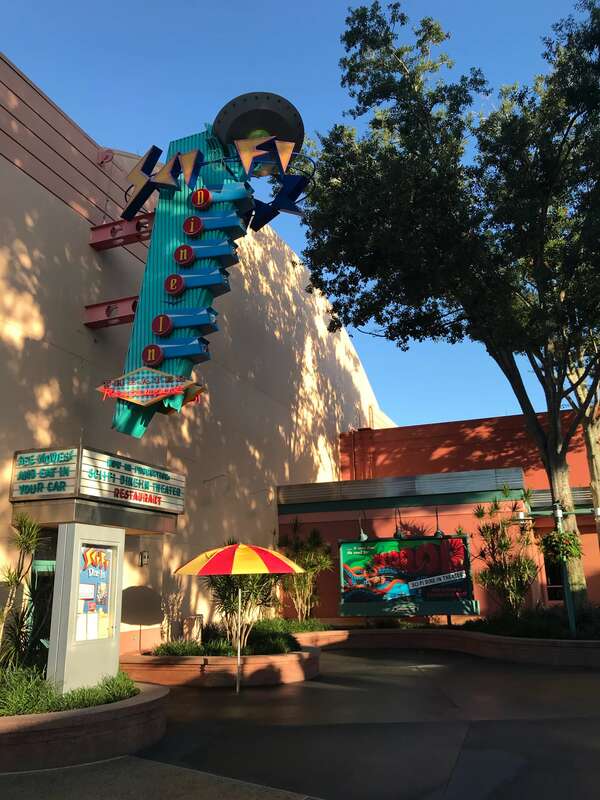 With Toy Story Land just opening we needed to go to Hollywood Studios a second time later one evening. 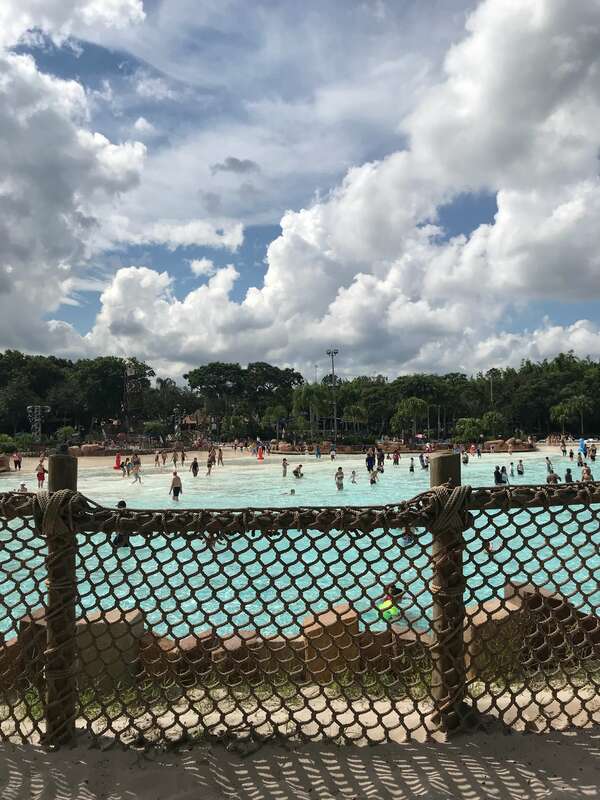 We also had the chance to go to one of the two water parks which we took advantage of, and it provides you with free mini putt (there are three courses on Disney property), a round of golf at the golf course, and entry to ESPN sports. Our trip would have felt so much more limited without the Hopper Passes! FastPass+ were a must for us. 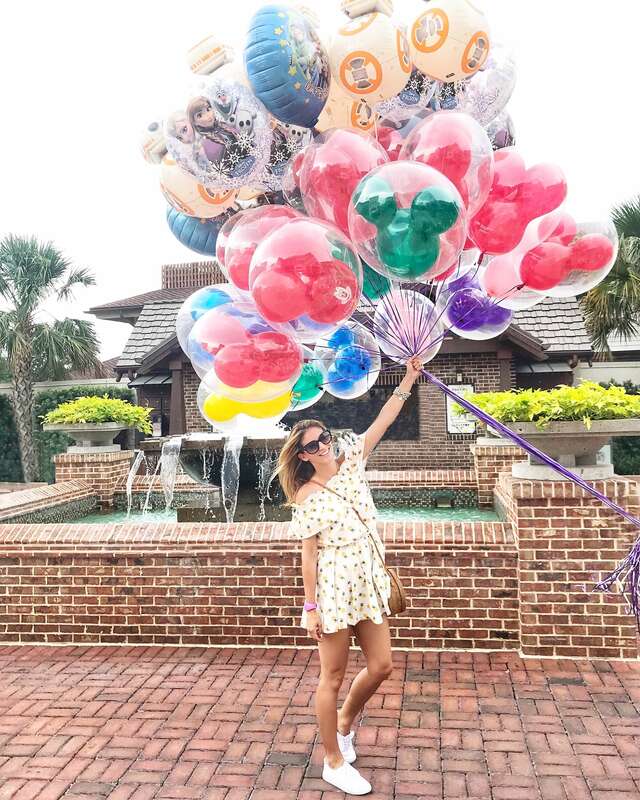 By staying at a Disney resort we could book our fast passes 60 days out rather than 30. This was huge! By having 60 days we were able to get on every ride we wanted! I am all about not standing in lines all day, and this was a saviour on our trip. I wouldn’t have it any other way! 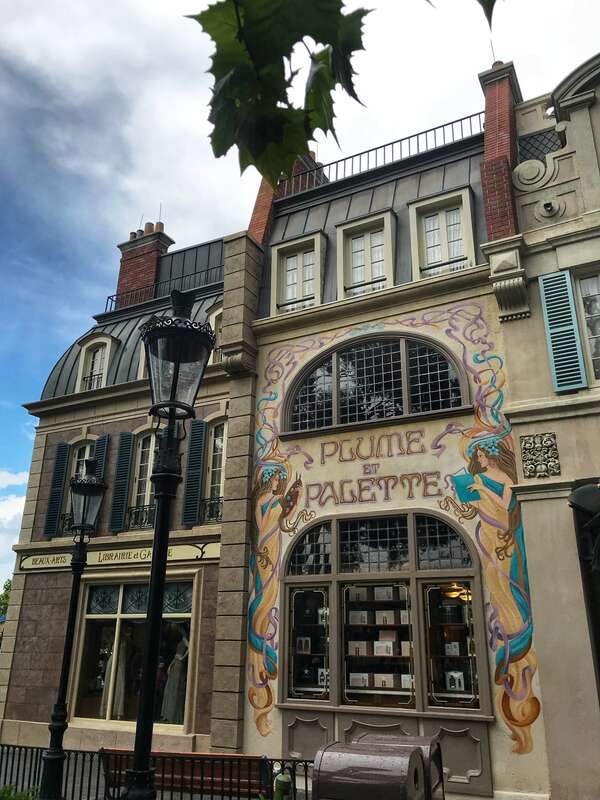 Here’s how they work – you can book three FastPass+ at once per day. They must be at least an hour apart. You also have a one-hour window. For example, a FastPass+ for Test Track would be from 9:00-10:00am. You can enter at any time during that window. After your last booked FastPass+ (ours would often be around noon) you can book one new FastPass+ at a time that day. We just didn’t wait for rides – we walked right on! We took advantage of Early and Late Magic Hours as well. 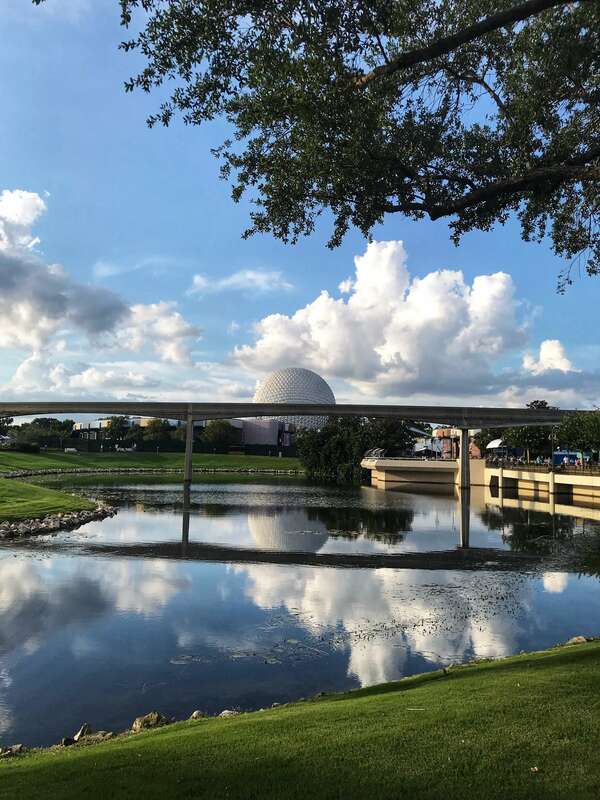 Disney Resort guests receive special hours at the park. 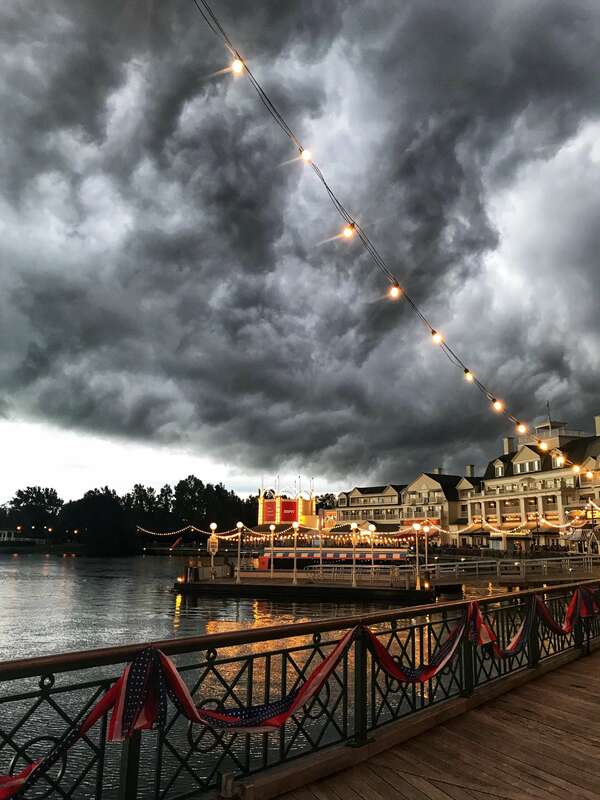 For example, one day Magic Kingdom might open from 8:00-9:00am just for resort guests, or Hollywood Studios would stay open from 10:00-midnight for resort guests. This made getting on an extra ride or two even easier! 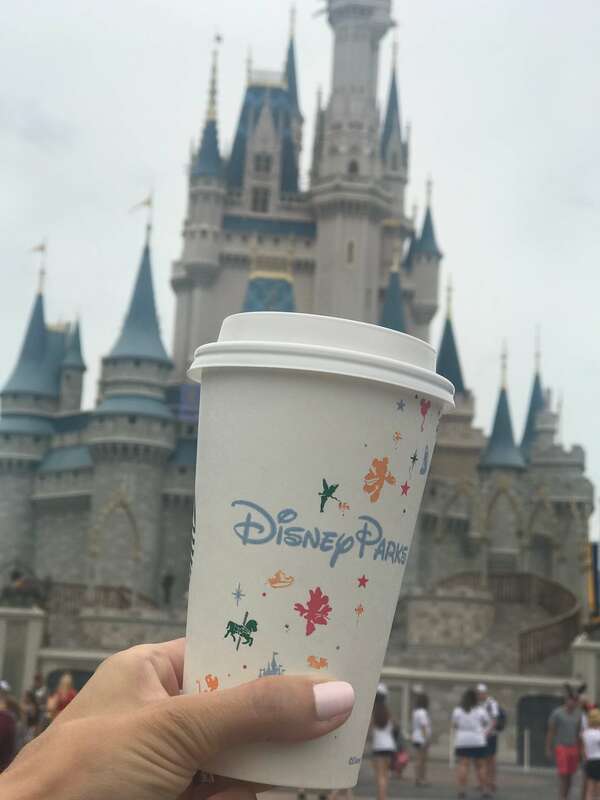 Prior to leaving on our trip I scoped out the extra Disney experiences we could take advantage of. 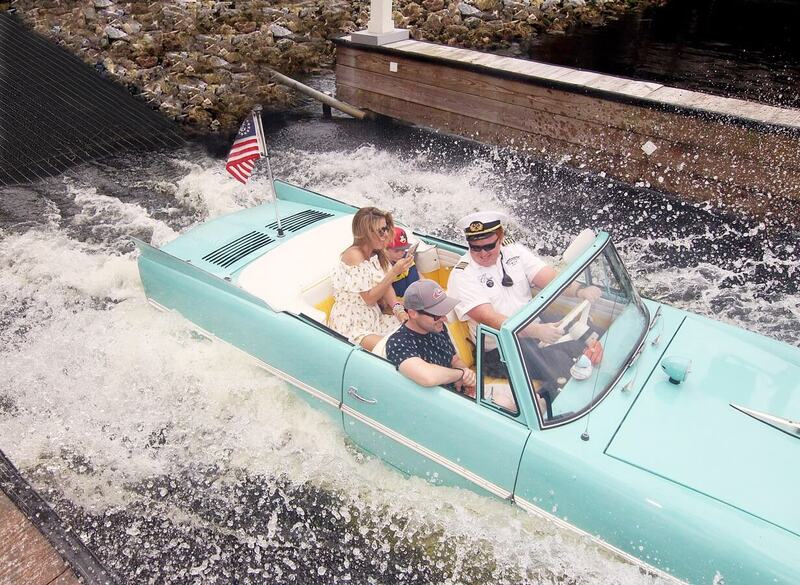 We chose two, one being renting a cabana for the day at Typhoon Lagoon. These cabana’s sell out quickly so order yours in advance of your trip! 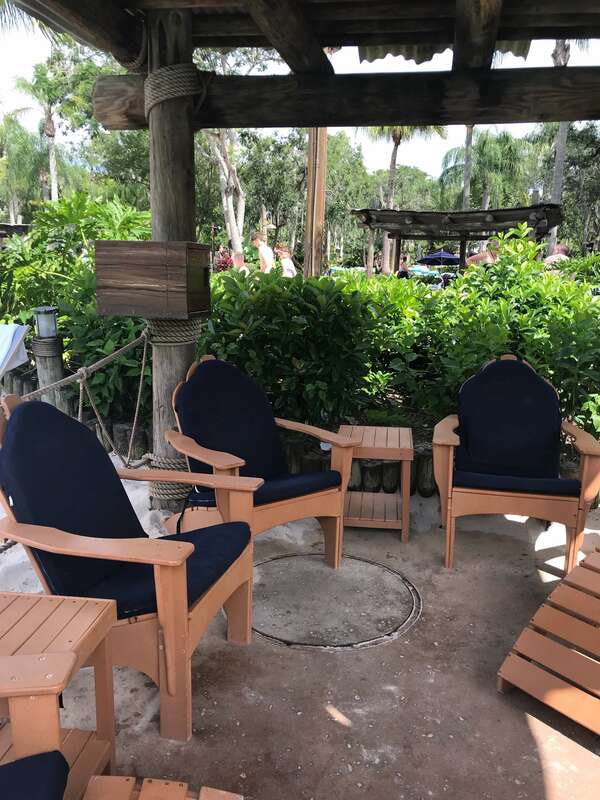 Ours included a covered seating area with chairs, a table, a cooler full of water, a locker with a key, towels, cups we could fill an unlimited amount of times with soft drinks, plus we had someone manning our cabana all day. We were provided their phone number, and if we wanted food, drinks – anything really we could text and have it brought to us! When Typhoon Lagoon opened at 10am we watched people RUNNING for seats. We were happy to have our spot booked – especially when it rained later that day. There were also clamshells for rent, along with a table, chairs and an umbrella at the water parks. Our second experience was the Ultimate Nights of Adventure VIP Tour. This was pretty awesome! Not a cheap adventure at $250USD each, but we loved it and thought it was worth it. 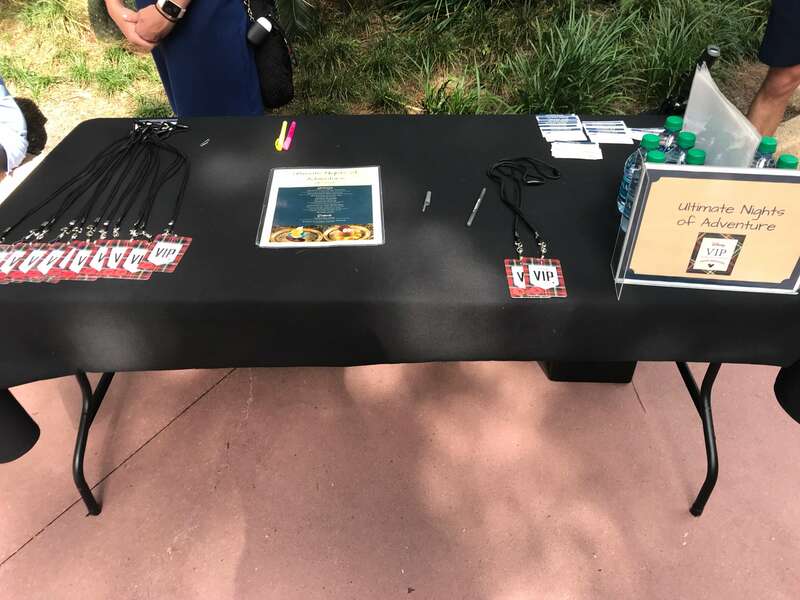 At 5:15pm we met the VIP team who gave us our VIP passes and ware bottles, and they gave us a menu to choose our drink and dessert for the evening. Part way through the trip it started pouring. As I mentioned, once there is lighting a certain distance away the outdoor rides stop. This actually gave us the chance to do Flight of Passage twice! Amazing right? It’s one of the most sought after rides in the park so we were happy. We stopped at for what we thought was dessert, but a platter of food was put in front of us, plus our huge desserts and drink orders. Alcoholic beverages were provided as well, along with light up necklace souvenirs. We brought our stroller with us, and the staff brought it to us after the rides! The cast members running our excursion were amazing and I can’t say enough about them. It was the best night of our trip! 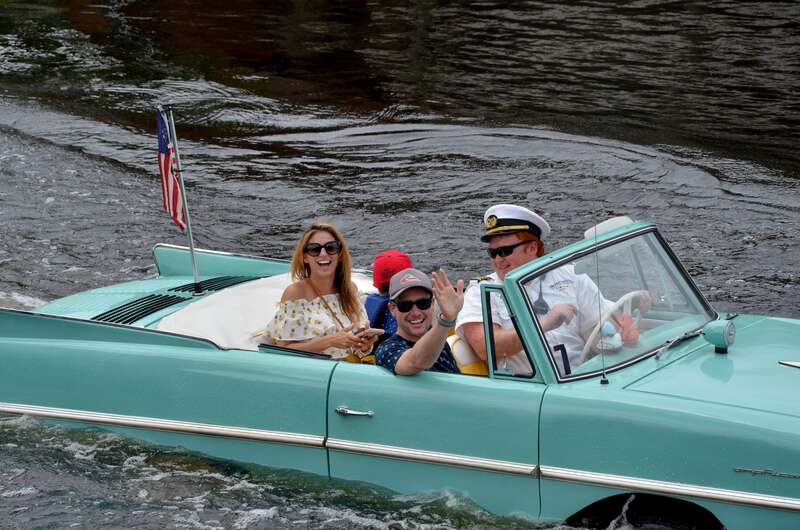 At Disney Springs we signed up for the Amphicar boat ride which was fun! You can’t book this one in advance but we had no trouble signing up. It was $150USD for a 20 minute ride, but totally worth it. They took photos of us as well which linked to our Memory Maker! We did not purchase the Disney dining plan. I didn’t want to be restricted on what I was able to eat, or trying to eat more to make it valuable. 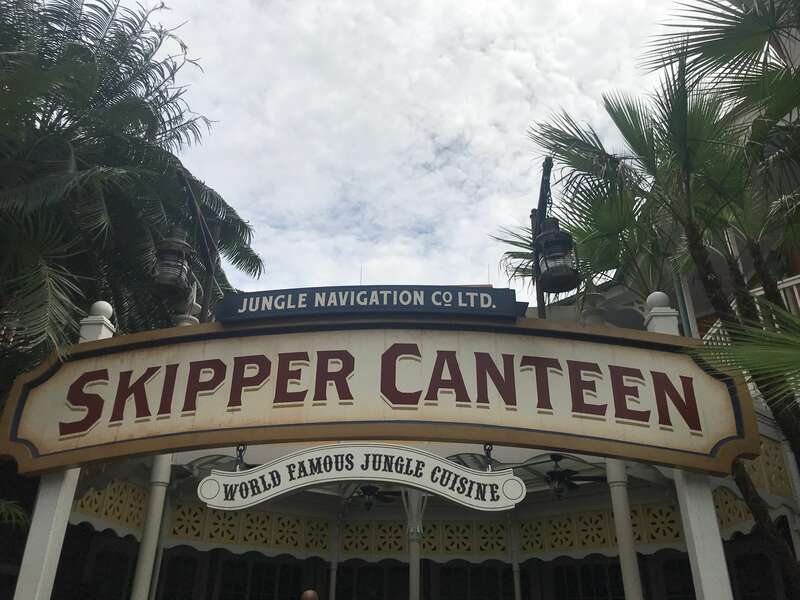 I booked most of our dining at the 180 day mark when we were able to due to our resort stay. The few places I couldn’t get into then, I got into a few days prior to our trip. If you don’t cancel a reservation within 24 hours there is a $10USD charge, so many spots opened up! Booking a lunch each day at the park was important for us because it was so hot. Having a break in the AC was just what we needed. Lunches and dinners tended to range between $80-130USD for our family of three, but my husband and I often both had a glass of wine at dinner, and we sometimes all shared an appetizer. At lunch time they picked one “Mayor” from all of the kids eating and made a big presentation where they were awarded a FastPass+ for any ride they wanted! 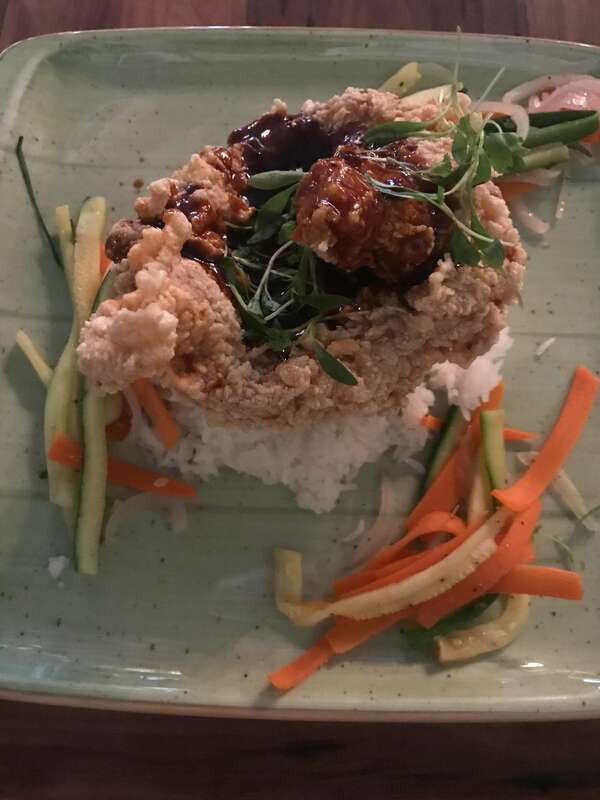 The food was good, but nothing incredible. I didn’t expect to love this one so much! It was All You Can Enjoy, so platters were brought to the table but we could have more of anything. We were stuffed! 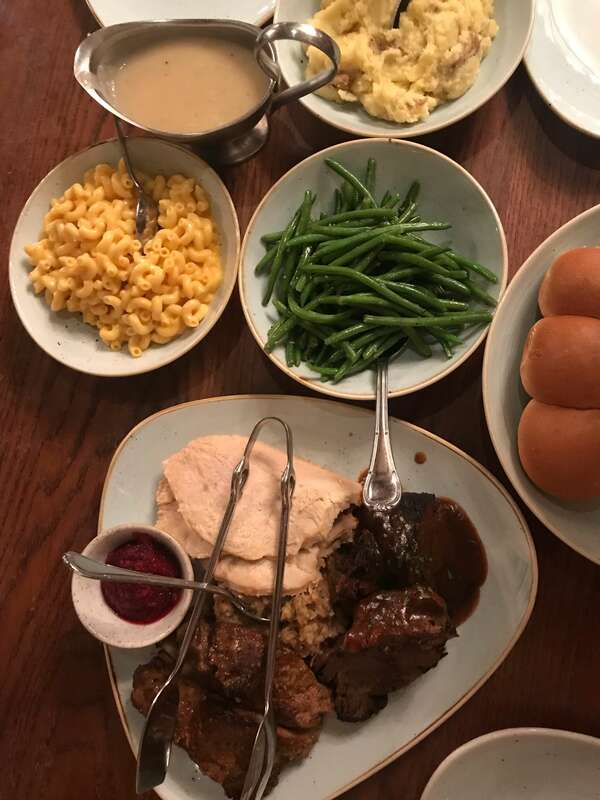 Salads to start, then chicken, roast beef, stuffing, potatoes – it was endless, topped off with dessert! Tons of flavour, and an impressive spread. Loved this one! You have to do this one for fun! 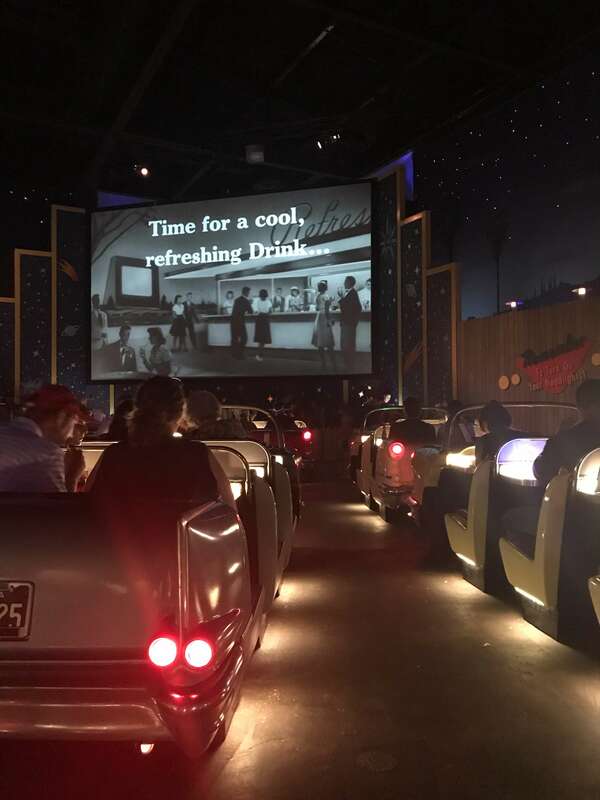 We ate in classic cars (two people per seat, three seats per car) and watched old cartoons and trailers for old scary movies. There was popcorn on the way in while you waited, then once inside the menu included deep fried pickles, burgers, ect. The food was actually pretty good, but the experience was really fun! Tip – if you don’t have a reservation you aren’t seated in a car – instead you are at a regular table at the back! This was amazing! 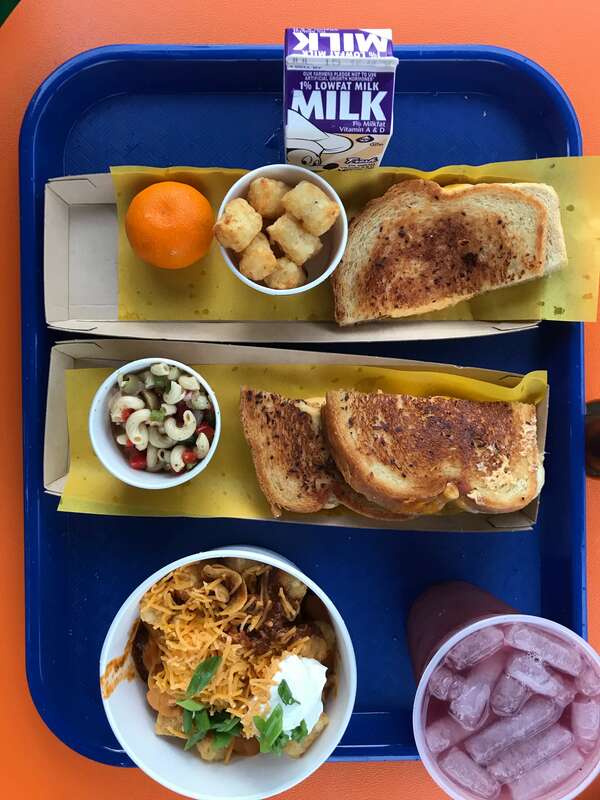 Three cheese grilled cheese for adults and kids (loved it) and even the side macaroni salad was good! We also had the fries which were amazing, and the adult lemonade was my favourite drink! My favourite! 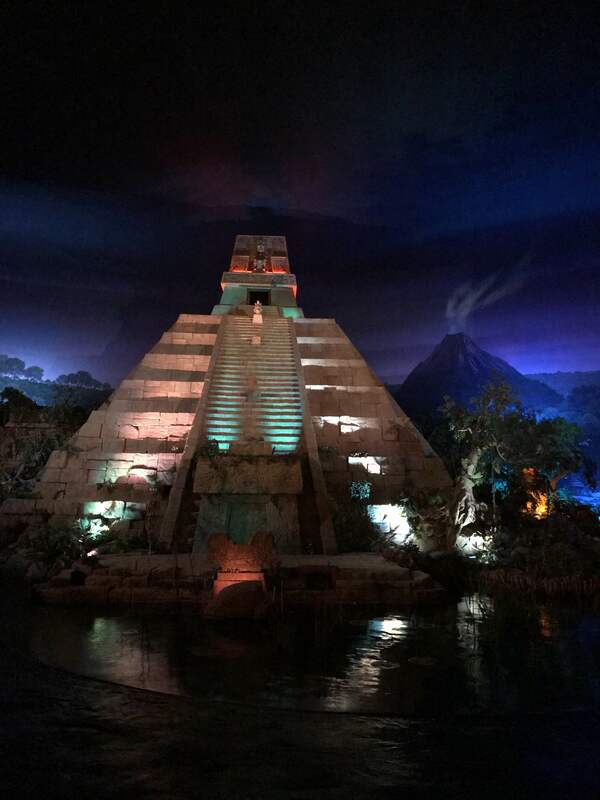 Situated inside the Mexico Pavilion, this reservation is hard to get! It has a really great feel, although it’s dinner almost in the dark. Inside it overlooks a boat ride the slowly and quietly rolls past in the water as well. The food was amazing. I had chicken tacos, and my husband had a flight of margaritas and steak tacos. 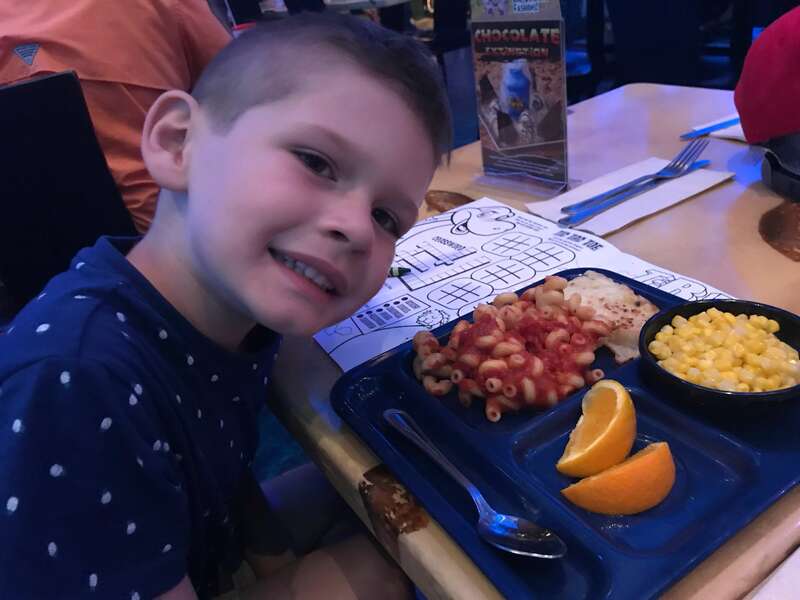 My son had quesadillas – a must-try! 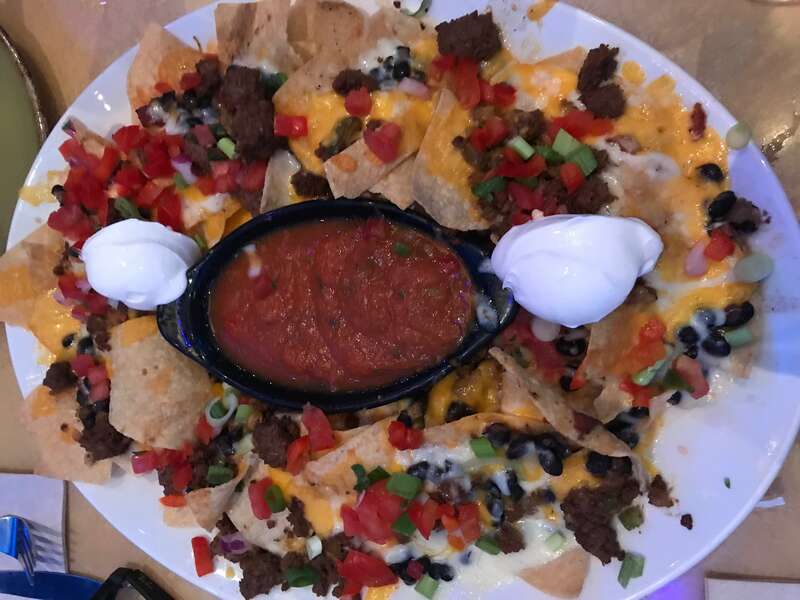 The portions were huge! 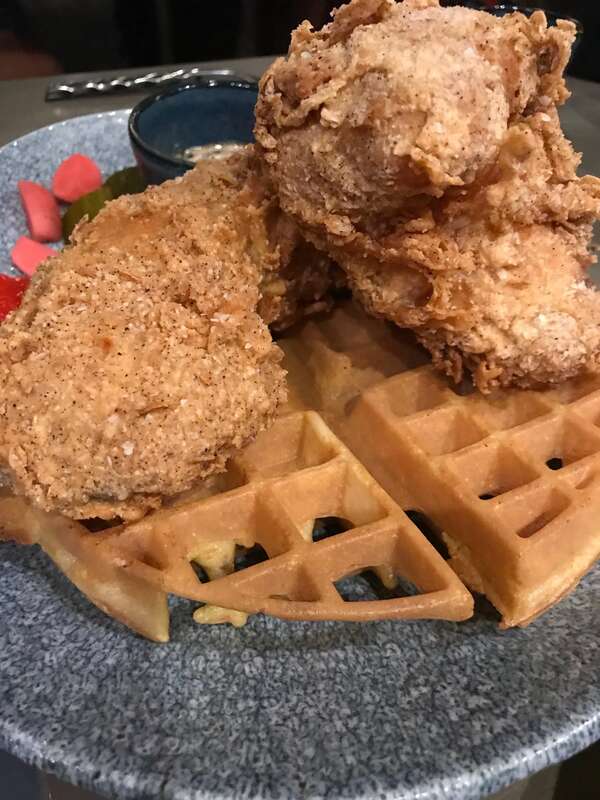 My husbands chicken and waffles was massive. 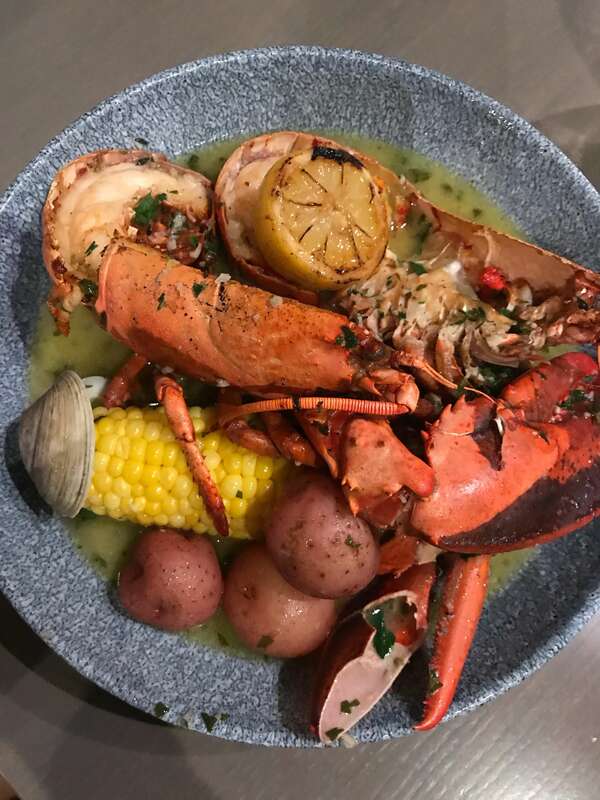 I had the lobster broil and it was amazing – the broth it was in was so good. Fabulous lunch with so many things we wanted to try! All three of us had great meals that we tried to steal from eachother! Amazing. 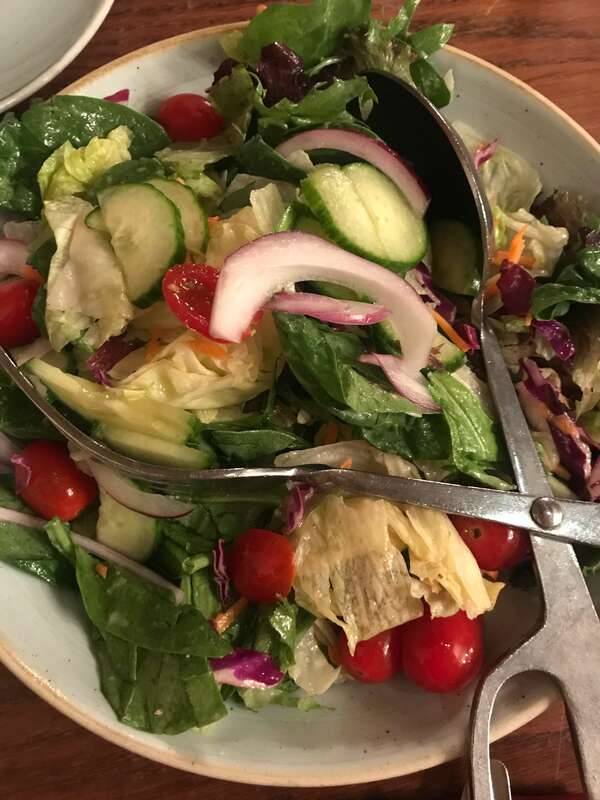 The decor, the food – so good! 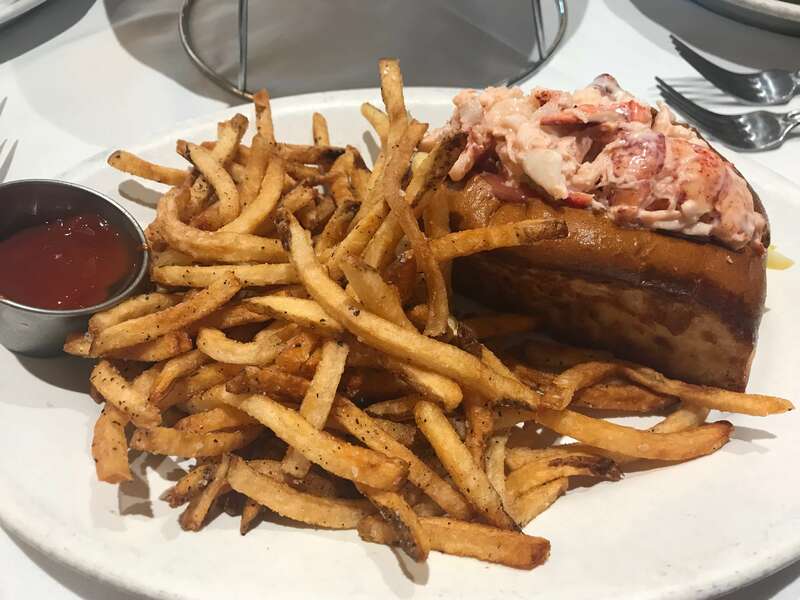 My lobster roll had a full lobster. Loved this place! This one reminded me of the Rainforest Cafe. Not super memorable, but my 6 year old thought it was fun. 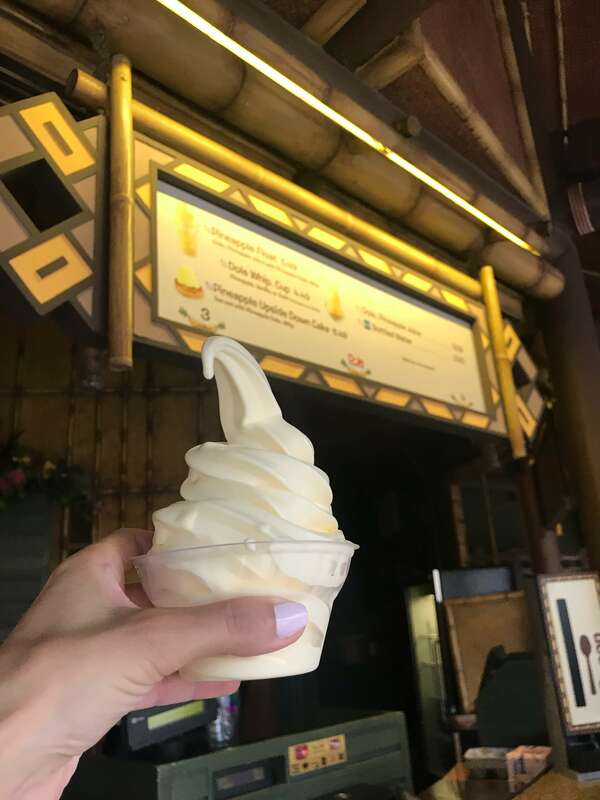 Here’s a roundup of all the snacks I had at different parks! I actually couldn’t tell you what to go on because everyone’s tastes are so different. 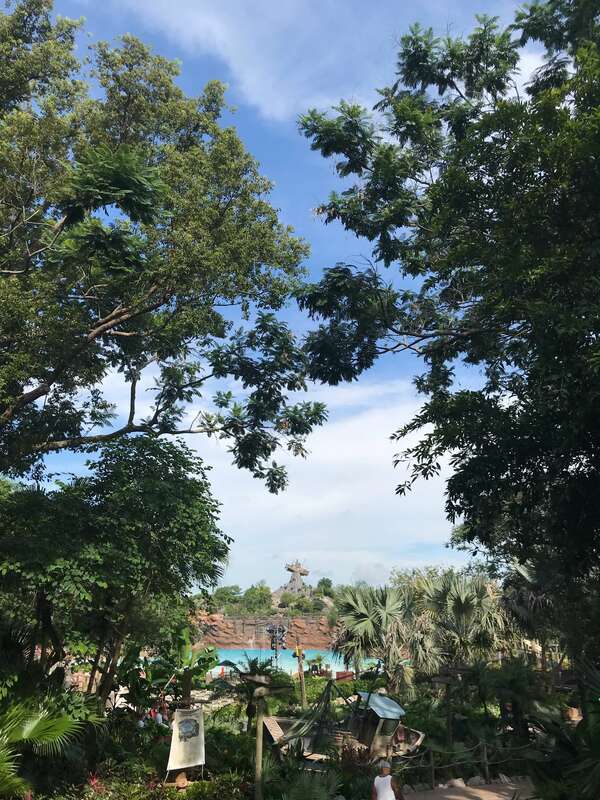 I’ll say this – Flight of Passage lived up to all of the hype I heard about it! Everest is my favourite roller coaster ever! I thought the Safari at Animal Kingdom was really fun. Everything at Toy Story Land rocks (we didn’t get on Slinky Dog), and Test Track at Epcot was awesome. 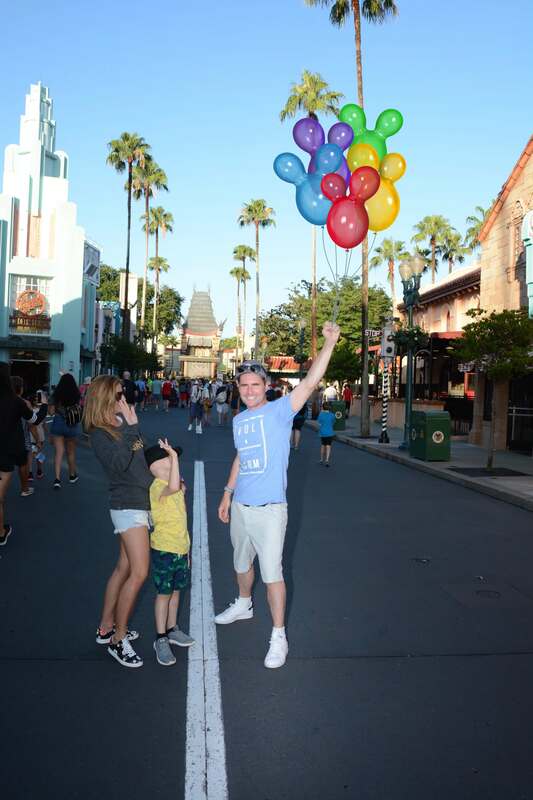 Soar’n at Epcot and Monster’s Inc. Laugh Floor at Magic Kingdom were two I didn’t hear much about but we loved them! There is so much, but here are a few more tips for your upcoming trip! 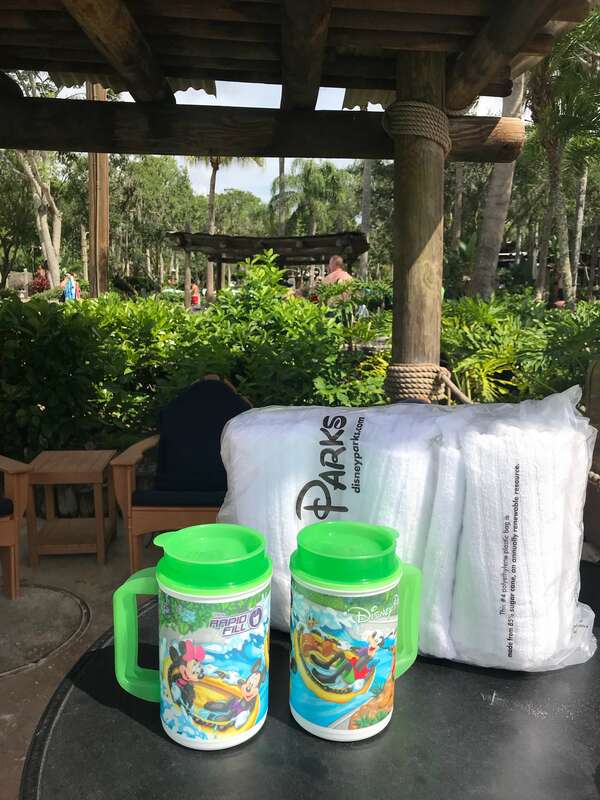 – Buy the Disney drink cups at your resort. They are refillable throughout your trip, and not only can you fill them with soft drinks but coffee and tea as well. – Buy the refillable popcorn bucket! Their popcorn is so good, and it’s only $1.75 each time you refill the bucket! -When sitting on the Safari ride at Animal Kingdom, try to sit on the left hand side of the truck. It’s so much harder to see the animals on the right hand side! -Take advantage of the lightning if you have FastPass+ – if there is lightening a certain distance from the park the outdoor rides shut down. 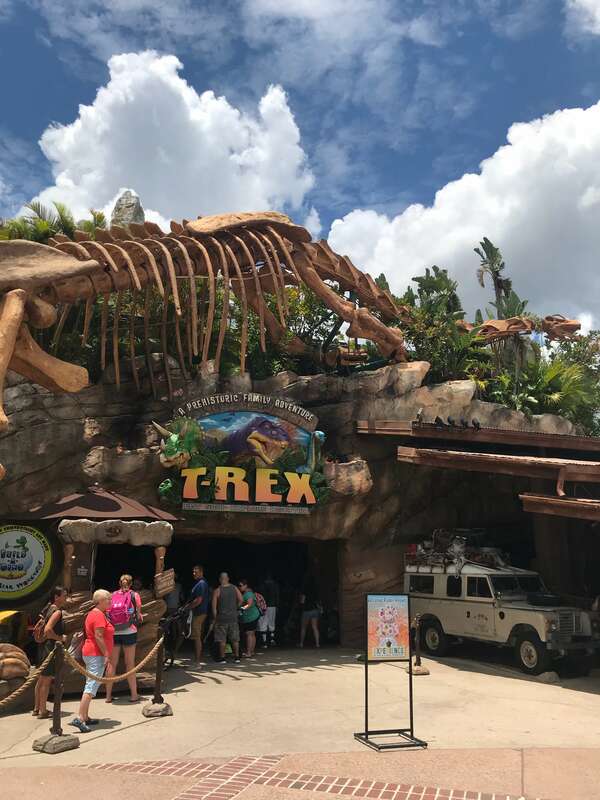 In the meantime your FastPass+ with either stay on hold until the rain stops, or you can use it as a universal pass for any indoor ride while you wait for the weather! 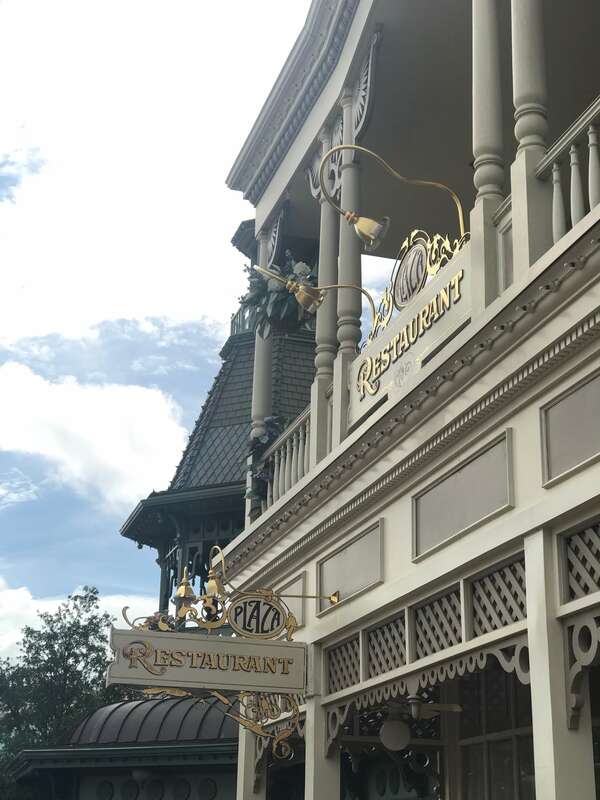 -When eating at The Plaza in Magic Kingdom, make your reservation for lunch time because they choose one child as the Mayor and give them a Fast Pass for any ride in the park! -Lyft is the only vehicle that can get you as close as the busses to the front of Magic Kingdom. It’s totally worth the cost of $25 for the quick ride and drop off at the front door! 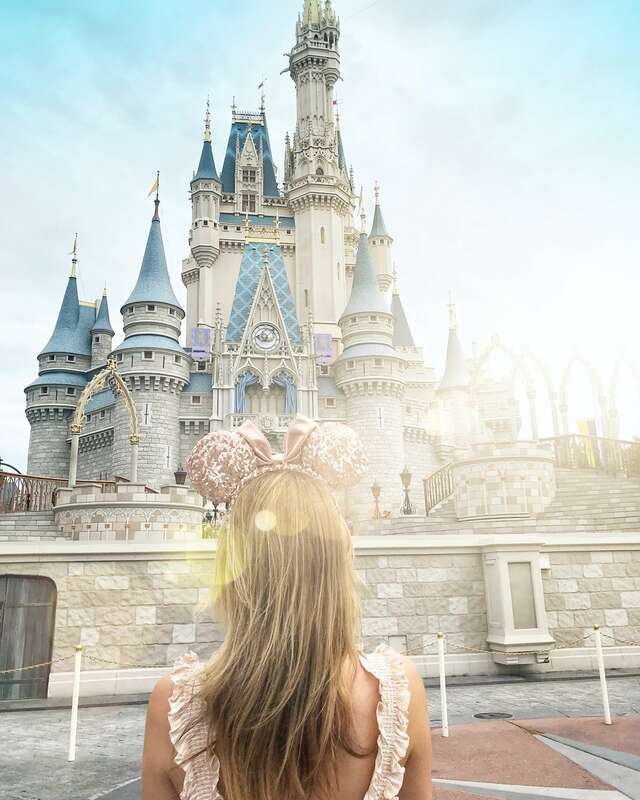 -If you want photos of the Magic Kingdom castle, use your early Magic Hours if you stay at a Disney resort and head straight there! Were were able to get lots of photos with no one behind us! 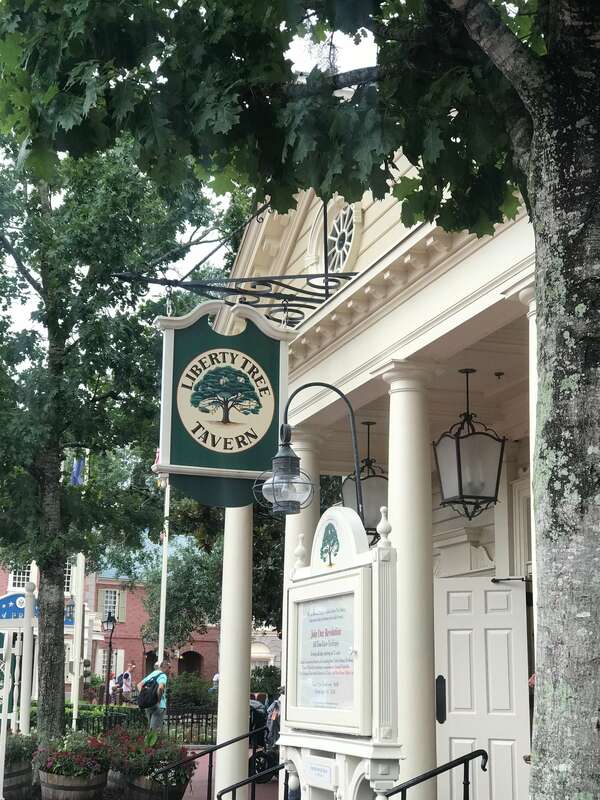 -At Liberty Square’s Ye Olde Christmas Shoppe in Magic Kingdom they will not only personalize your Christmas ornament, but they will deliver it right to your resort. 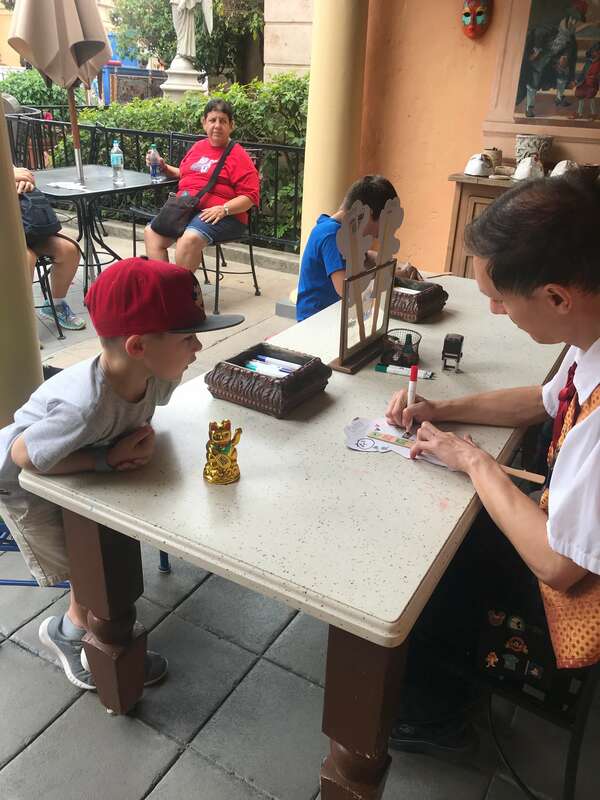 Each resort has a pick up desk in their Marketplace – you can order anything from the parks and they will send it to that desk for you. -Looking for that new Rose Gold backpack? It’s at Epcot – all of the resorts and stores were sold out when we left a couple weeks ago, but one store in Epcot had 500! -Take advantage of Uber and Lyft at the resorts. When we would go to each park we often bypassed the busses because Lyft was only a $5 ride! It was a very easy way to get around! 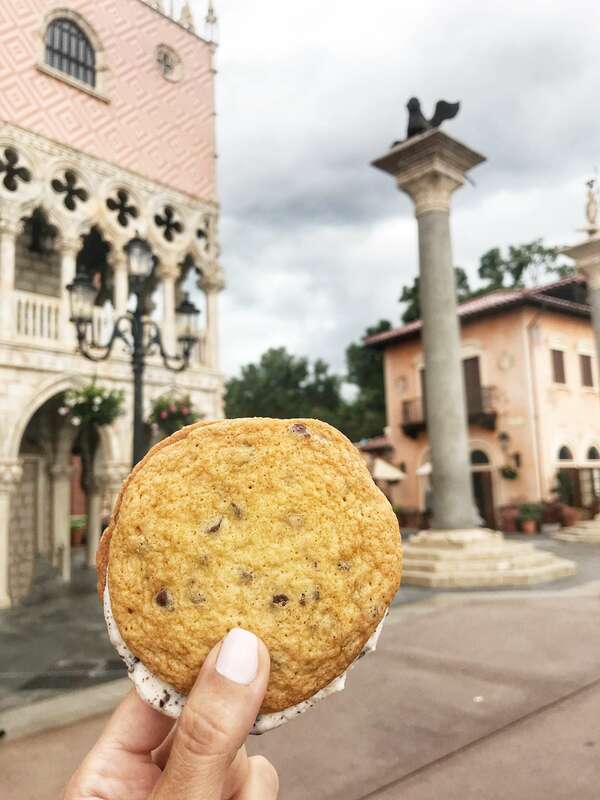 -Uber Eats had very limited options for deliver to our Disney resort. Not many restaurants were offered so we didn’t use the service at all. – If you staying at Beach Club, the Marketplace at Yacht Club had a better breakfast including oatmeal, smoothies and breakfast sandwiches. 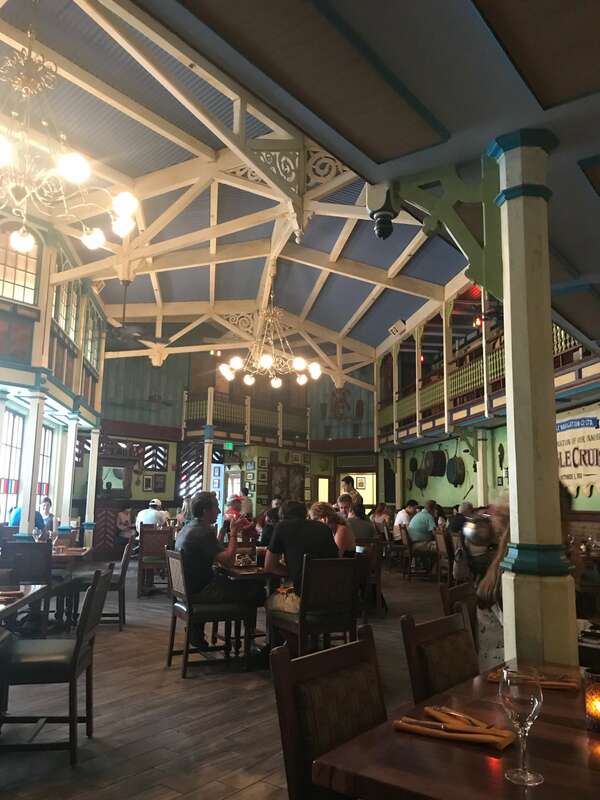 -Many of the Disney Springs restaurants could have reservations made via Open Table. Download the app for another way to make those reservations! 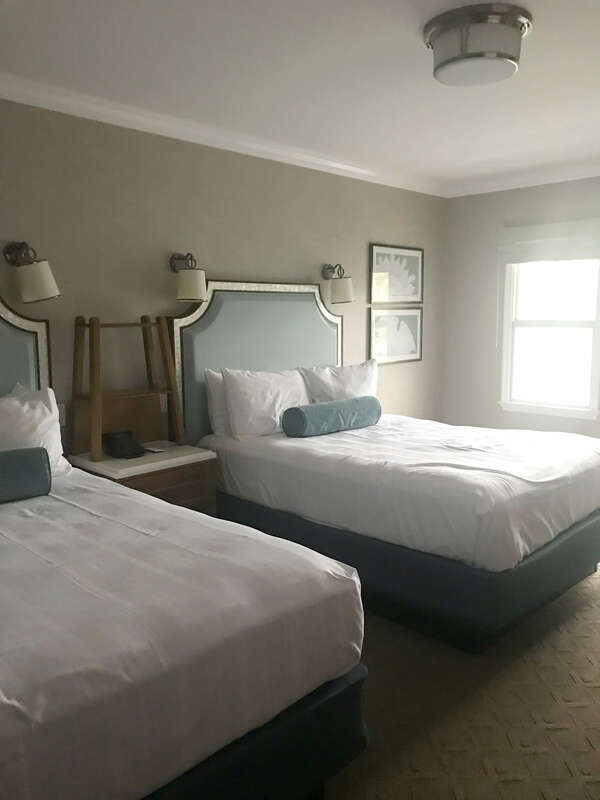 -We made our reservations 180 days out from our vacation, but one to two days out of our meal’s I checked the app again to revise to earlier or later times for dinner. 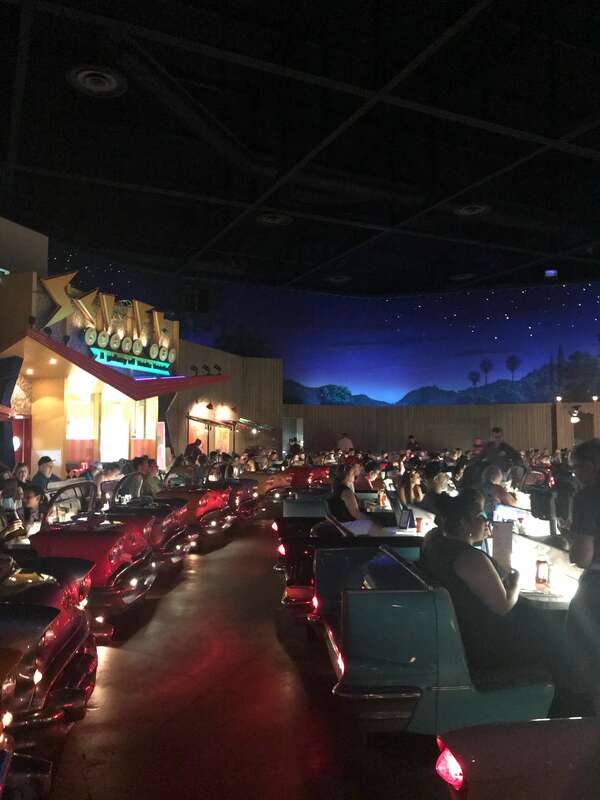 Many people dropped reservations just before they were charged for missing their meal (there is a $40 fee if you miss a reservation). -I recommend making a lunch reservation just for the air conditioning break! In July it was so incredibly hot having a lunch reservation was more of a cooling down period. 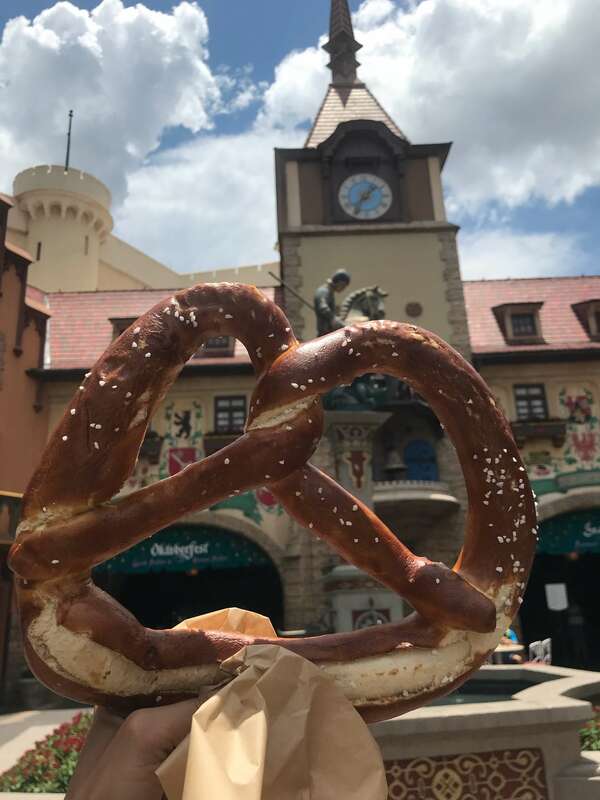 -I bought a pretzel outside in Epcot Germany and went into a store. I ended up dropping it, and the cast member who sold it to me walked inside and gave me a new pretzel! I had no idea how she could have known, but it was kind of magical! 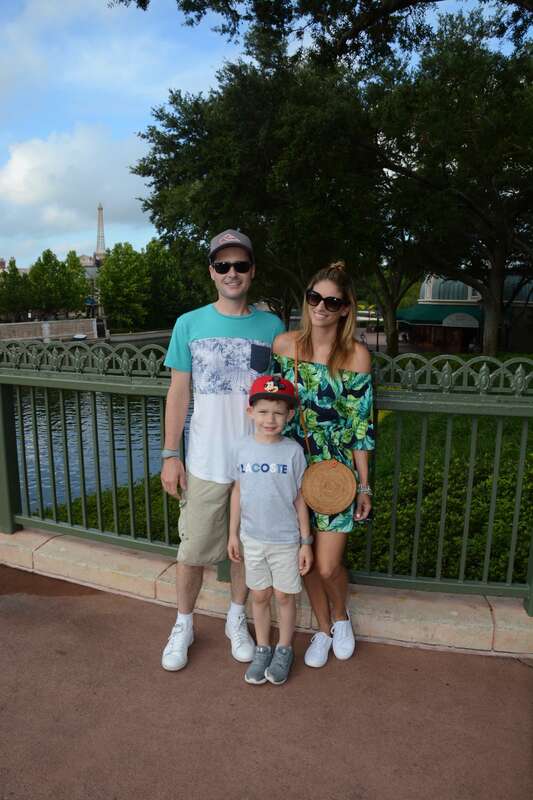 -In Epcot kids can stop in each country to have their passport stamped! They can either purchase a special passport one of the shops, or take the free Passport Bear and have it stamped. The stops are called Kidcot Fun stops, and kids can colour their bears there as well! 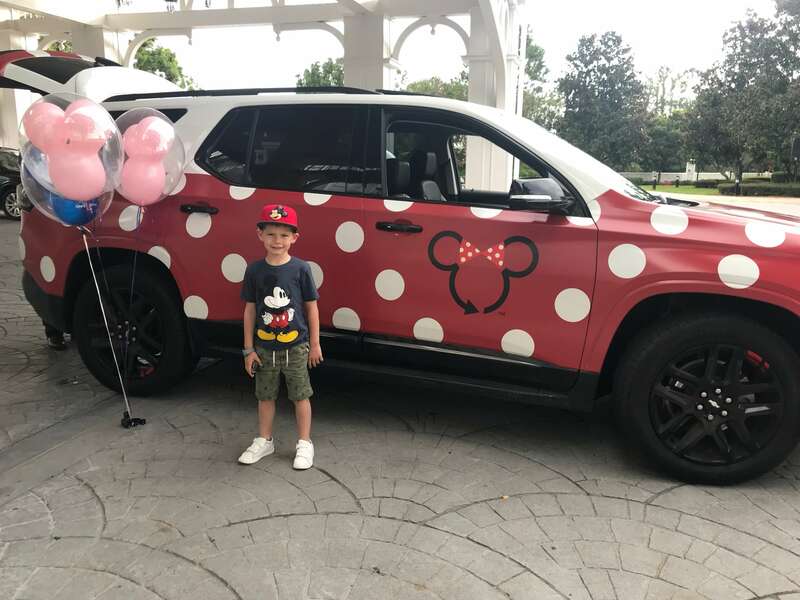 -Staying at a Disney resort means your transportation is covered as well. The Magic Express picks you up at the airport, and takes you back to the airport at the end of your trip! 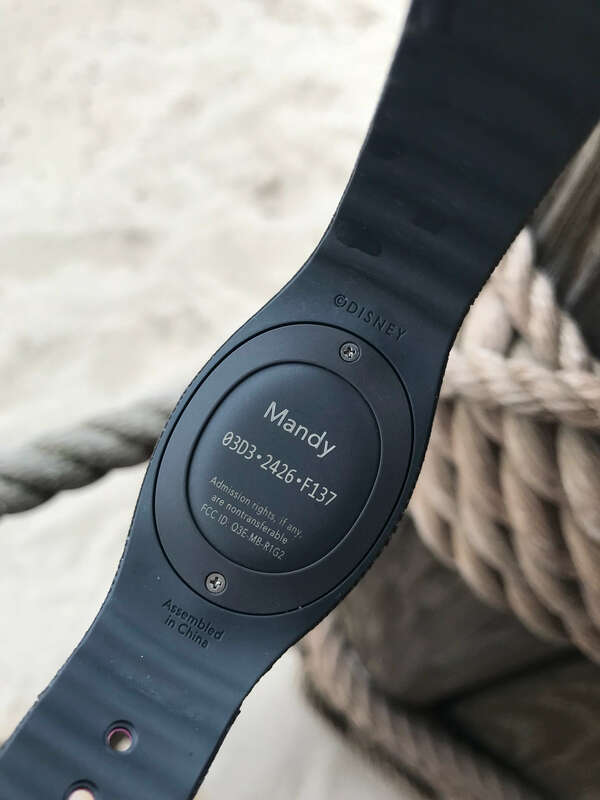 We were sent luggage tags in advance of our trip, and once you add them to your bags certain airlines will take them straight to the hotel – you don’t even pick them up at the airport – they go straight to your room! 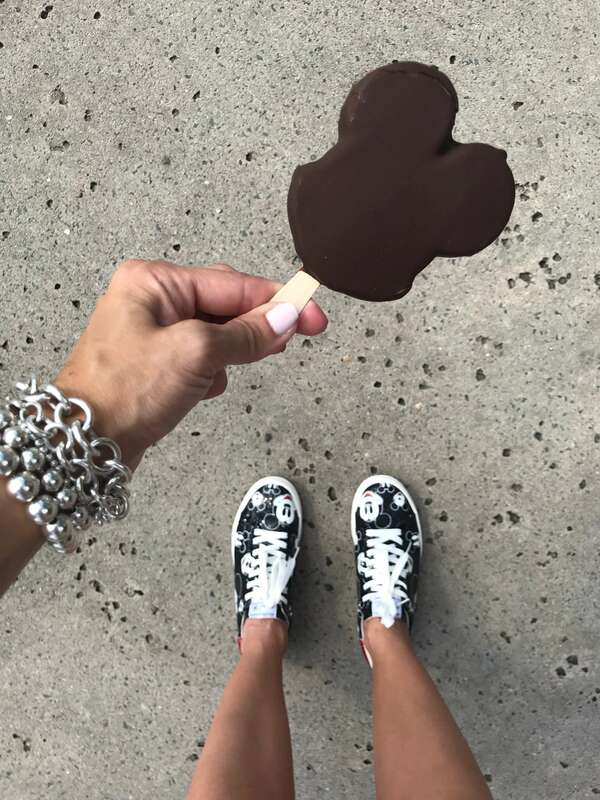 I hope some of my tips have been helpful if you are getting ready for a trip to Disney World! Let everyone know in the comments if there are some tips I missed! 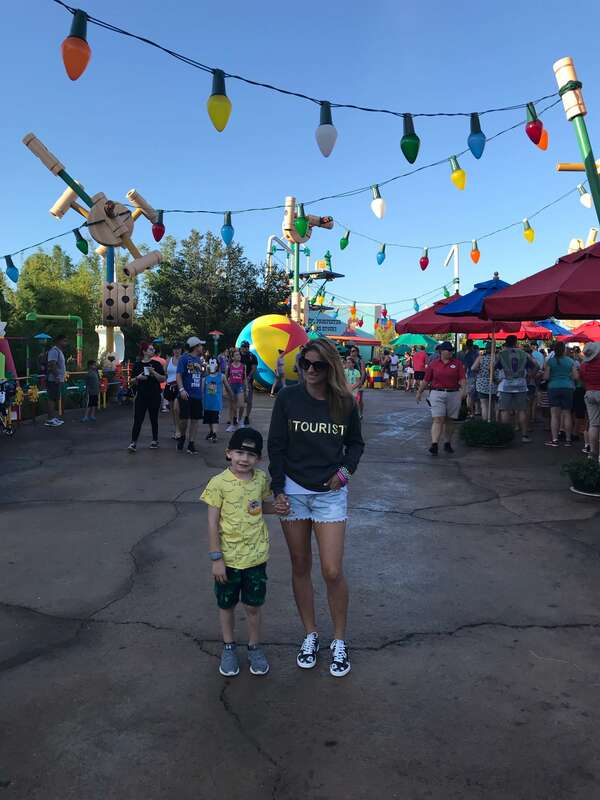 So many good tips – oh how I kicked myself for not bringing the cheap ponchos – had to pay up both at Disney and Universal Studios – you think I would have learned my lesson lol! Getting in early for that castle pic was so worth it! Also – I haven’t heard of this rose gold backpack, will look it up! Mandy, thank you for the very thorough trip report and great tips. I’m a veteran visitor but still learned some goodies. 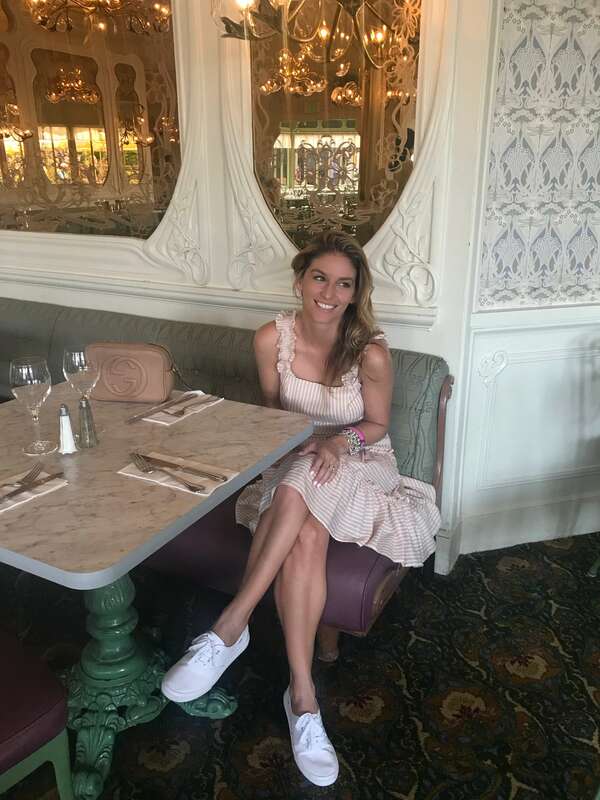 One question though, are you saying that no matter what, as long as you put your name down on that list for beaches and cream, you will eventually get a table despite not getting the true ADR? it might just take a couple of hours? That would be WONDERFUL, if I’m understanding it right. I too never got a reservation, and knew stalking would be in vain because they hardly have tables as it is. Hello! Thanks so much for reading! I appreciate it! Yes we had no reservation, but any of the nights during our stay we could go on the waiting list to have a seat inside Beaches & Cream! We were worried too about not getting in, but we gave them our phone number and received a text in a little less than two hours!